Nichols Farms thinks outside of the can. A few years ago, Lloyd Nichols started growing edamame. “I thought, oh my goodness, this is really gonna take off!,” recalls Nichols, who runs Nichols Farm & Orchard with his wife and three sons in Marengo, Illinois. “But it just never got big.” No loss: “Big” isn’t Nichols’s primary objective. 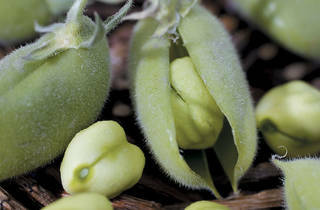 The farm prides itself on variety, which is why last year one of Nichols’s sons suggested the farm add to its array of beans a different edamame-like product: fresh garbanzo beans, which in Mexico are eaten steamed, salted and popped out of the pods as a snack. 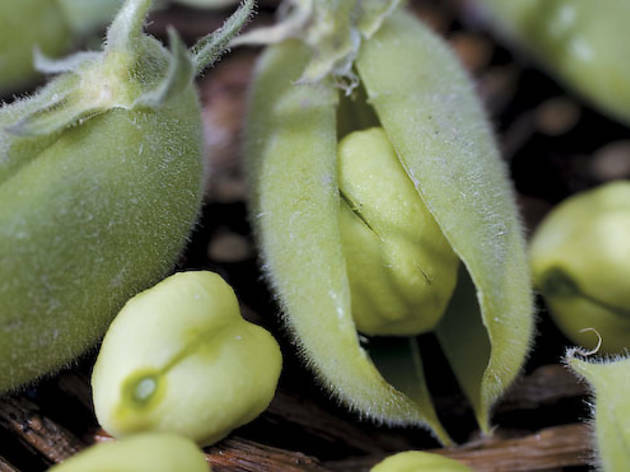 After a small run last year, Nichols increased its garbanzo-bean plantings for this summer, showcasing containers of the bright green, fuzzy pods to customers who’ve rarely seen chickpeas outside of a can. When they’re this fresh, Big Jones chef Paul Fehribach likes to eat the beans raw, while C-House chef Nicole Pederson briefly blanches the fresh garbanzos and then purees them into hummus—the same technique applied to the canned variety, but boosted by a product more tender and sweet. Available for $8/pound at Green City Market, Wicker Park Market, Federal Plaza Market and others while quantities last.